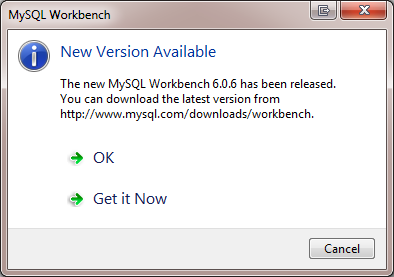 You can download the latest version. Which button would you press? So, which button should I press to get the update? And then I’m presented with two options: OK and Get it Now. My train of thought was: it says I can download it from this URL, so okay I want to download it. The dialog box closed and nothing else happened. What?! What just happened there. I thought I had just said that I wanted to get the new version. I clicked OK but it did what I would expect a cancel button would do. But that’s cancel! There is already a cancel button. And there is also a red [x] button in the top right-hand of the dialog box which also cancels the dialog box. That’s THREE different ways to cancel the dialog box. But they are offering me an upgrade, to make the software better, so why not make that the most obvious, easiest to select option? This dialog box now has one clear call to action. 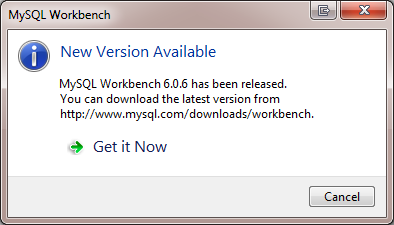 Now it’s simply telling me that MySQL Workbench 6.0.6 has been released, where I can download the latest version if I want to do it independently of this dialog, and now there is only one, clear call to action: Get it Now. Posted on Friday 30 August 2013 Thursday 14 December 2017 Categories ComputerTags dialog, Don't make me think, Error'd, MySQL, UI fail, Windows, WorkbenchLeave a comment on Which button should I press?